Talking Brains: Imagery or meaning in category-specific brain activity? Imagery or meaning in category-specific brain activity? A common finding in the functional neuroimaging of "semantic processing" is that motor areas activate, somatotopically even, during the processing of action-related words. For example, when subjects process (e.g., read) a word such as kick, motor areas corresponding to leg movements are activated, whereas for a word such as kiss, lip areas are activated. 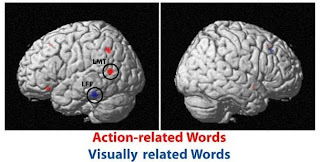 The problem with this type of result is that it cannot determine whether motor cortex is activating because it is part of the semantic representation of the words (the usual claim) or simply because there is an association between the word meanings and the actions they refer to. That is, the meaning of kick may be stored independently of motor cortex, but because this meaning is associatively linked to kicking actions, access to the meaning of kick results in spreading activation within brain networks to which it is associatively linked, including the leg region of motor cortex. 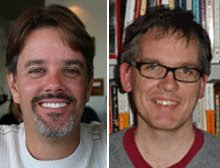 A recent study by Hauk et al. (2008) attempted to address this "imagery" vs. "meaning" ambiguity. They designed a decent study. There was a set of action words (e.g. ‘grasp’, ‘limp’, ‘bite’) and a set of non-action words that had imageable attributes (e.g. ‘snow’, ‘blond’, ‘cube’) and they looked for regions that showed word frequency effects that were specific to one category versus the other. The logic was that imagery processes should not so sensitivity to word frequency effects, as word frequency effects are associated with lexical-level processes. We could quibble here -- e.g., they didn't control concept familiarity -- but let's not. we corroborated previous results showing that action-relatedness modulates neural responses in action-related areas, while word imageability modulates activation in object processing areas. Again, based on their findings, these "perception-action systems" don't seem to involve motor cortex. The findings of this study are interesting, but they seem to support the view that even action concepts rely more on posterior brain networks than frontal, motor-related brain networks. Your "well, no" seems a little strong. I don't think this result should be interpreted to say that the motor cortex plays no role in the coding of motor semantics. I think its interpretation depends on how you view the relationship between semantics and frequency effects. Have you seen the recent Postle et al paper in Neuroimage? That sheds some interesting light on regions involved in semantics of action verbs. The point here was that if you don't read the paper too closely you might be misled to the that frequency effects had occurred in motor cortex. I agree that lack of frequency effects in M1 does not provide conclusive evidence against the motor theory of action semantics. But at the same time, what evidence IS there for the proposal? I've looked at all (or most at least) of the evidence cited by Pulvermuller and others, and none of it is convincing -- not the TMS papers, functional imaging papers, ALS, or stroke papers... All can be explained without assuming that action semantics lives in M1. If I'm wrong about this, somebody set me straight. If you believe in an embodied action semantics, show me why. The problem (I think) is in defining the scope of a semantic representation. Rather than focus on "action" words lets take a different example. What about words that relate to the sense of smell. Does a person who lacks a working olfactory system "understand" the "meaning" of the word "perfume"? From an abstract, functional standpoint: yes (maybe?). I would also think, however, that there is something missing from such a person's concept of perfume -- it is impoverished in important ways. Consider two people watching a tennis match (say Federer vs Nadal at Wimbledon): one person is an experienced player, has been playing tennis for twenty years, has a crisp backhand and a solid volley; the other has never picked up a racket but has been an avid fan for 20 years. Doesn't the first person have a different understanding of the tennis match than the second? Here's the question: Are sensory and motor systems involved in "meaning"? Or just sensory systems? And, if sensory, why not motor? Define what a semantic representation entails? What a novel concept! ;-) Thank you for bringing that up Brad, you are exactly right. Whether a motor (or sensory) representation is a part of a semantic representation is going to boil down to what we count as a semantic representation. If the concept TENNIS maps to the knowledge that it is a game played with a net, a racquet, and a small ball, then you don't need to know how to hit a volley to have the concept. Clearly someone like Federer is going to have a different "understanding" of the game because he has a rich set of sensory and motor associations that most of us don't. Is Federer's volley grip part of his concept of tennis? Embodied cognition theorists may be inclined to say yes! And fair enough. But then do we include *all* of Federer's idiosyncratic associations with tennis as part of the concept? The weight of his racquet? The smell of his tennis bag? The color of the ball? The bark of the line judge? Or for us commoners, How about the motor programs associated with turning on the lights at your local court? None of these are particularly central to the concept TENNIS. Then again, maybe you want to claim that a concept is nothing more than the sum total of all one's experience with something. If so, then sure, the motor programs involved in YOUR serve are then part of your "understanding" of tennis. Is this the claim of the embodied semanticists?